This small shop is leavening some big biscuity business. Dishes: Flaky buttermilk biscuit with jam made daily ($2.50); Ham biscuit featuring local Virginia ham on a classic buttermilk biscuit ($3.00); Biscuit and gravy with gravy flavors that rotate between a sausage gravy, featuring locally sourced sausage, and a vegetarian cheddar sawmill option ($5.50). Tim Laxton had nearly fallen asleep one night when a thought crossed his mind. “Y’know, Richmond needs a really good biscuit,” Laxton said, recalling that thought. “My mom always used to say, you need to have a gimmick,” Laxton says. “The thing that is you. The thing that makes you feel alive…the thing that you know you were called to do.” Since last July, the proprietor of Early Bird Biscuit Co. & Bakery has been baking the city’s first true really good biscuit. Vintage knickknacks and kitsch decorate his little 725-square-foot bakery: There’s the cuckoo clock that belonged to his grandmother (“I used to love to pull the pine cones,”), rotary phone, collection of old rolling pins long past their prime, and other retro accoutrement that make Early Bird Biscuit as much a time machine as it is the city’s first bona fide biscuit shop. Raised in a Southern family, Laxton often ate a regional staple: the biscuit. “It’s a quick bread,” he says. “My mom used to say you need to have a quick bread in your back pocket just in case you’re entertaining” or need it to pair with a meal. After graduating from VCU in 1990 and working various part-time jobs, Laxton landed a corporate sales position at Marriott. But after a decade, the company restructured in a way that ultimately put Laxton out of work at the height of the recession. So he did what any average person would do: created a successful pool-cleaning business in Middlesex County. But it wasn’t his gimmick. “I just hadn’t settled on that one thing that made me feel alive and nourished,” he said. Until the night of his biscuity epiphany. While driving to a New Year’s Eve party in 2012, Laxton passed a vacant property at 5411 Lakeside Avenue. “I just looked at the building and said, that’s it. I just knew it.” That’s where he’d bake biscuits for a living. He said biscuits are the “quintessential Southern vehicle,” something you can eat alone, use for a sandwich, or to sop up any remaining sauce. “It’s something that’s really basic and straightforward,” he said. On a busy day, Early Bird pumps out 400 biscuits, in addition to the homemade apple pie, chicken salad, pimento cheese, and other offerings. Not long ago, after closing up on a Friday afternoon, Laxton took part in the nearby Holly Jolly evening festivities. Between regular business on Friday, the Holly Jolly, and normal Saturday hours, Laxton made 1,647 biscuits. “So in less than 24 hours I made almost 1,700 biscuits with these two hands,” he said. Laxton wakes at 4:15 am, six days a week, to ready Early Bird for its 7 am opening. 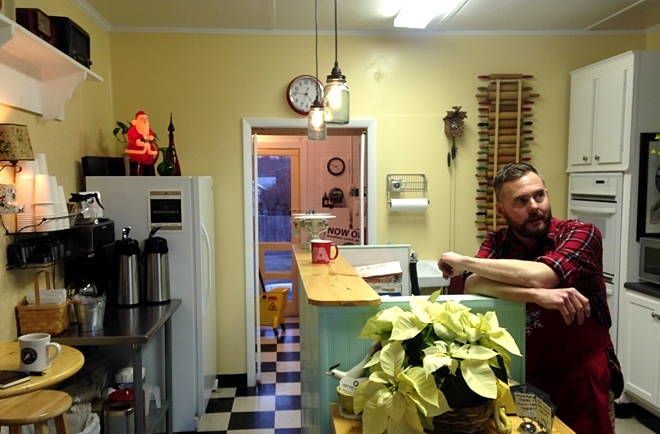 “People are usually in the parking lot before we open,” he says about those who pep up for the day with a biscuit and a Blanchard’s custom coffee brew.2 They wait for the rewards of Laxton’s hands-on approach to making biscuits. When it comes down to it, he’s a biscuit libertarian. “You can take it home, and what you do with your biscuit is your business,” he says with a smile. While business is good, Early Bird doesn’t offer the relaxed pool cleaning schedule Laxton once had. Not only does he wake up before dawn, but Laxton often doesn’t leave the store until long after the sun has set. “I’ve never put in these kind of hours at any job, but I love it. I wouldn’t be here if I didn’t,” he said. But a business like Early Bird Biscuit isn’t something easily duplicated. It’s a place that’s both here and there, straddling the past and the present. It’s simultaneously something familiar; something new. Early Bird Biscuit Co. & Bakery is located at 5411 Lakeside Drive.